Freightliner PL is a company engaged in the carriage of goods by rail in Poland and in neighbouring countries, belonging to Genesee & Wyoming Inc. – an American company of the railway transport industry, which is present on four continents. Our operations in Poland began in 2007 and within a short period of time we became an important supplier of rail freight services. As the first and only company in Poland, we started operations based on a brand new rolling stock. 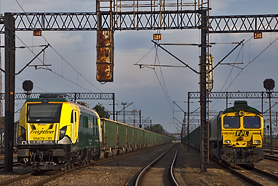 We have been one of the largest rail carrier of goods in Poland for many years. Thanks to the high level of services, timely deliveries, and innovative technological and organisational solutions, we are ready to meet the needs of demanding clients. We would not be what we are today, if it were not for the exceptional people who run this company. Meet the managers of Freightliner PL. No carrier has introduced so much innovation into rail transport technology in such a short period of time. Find out what characterises our rolling stock.